Hi everyone! 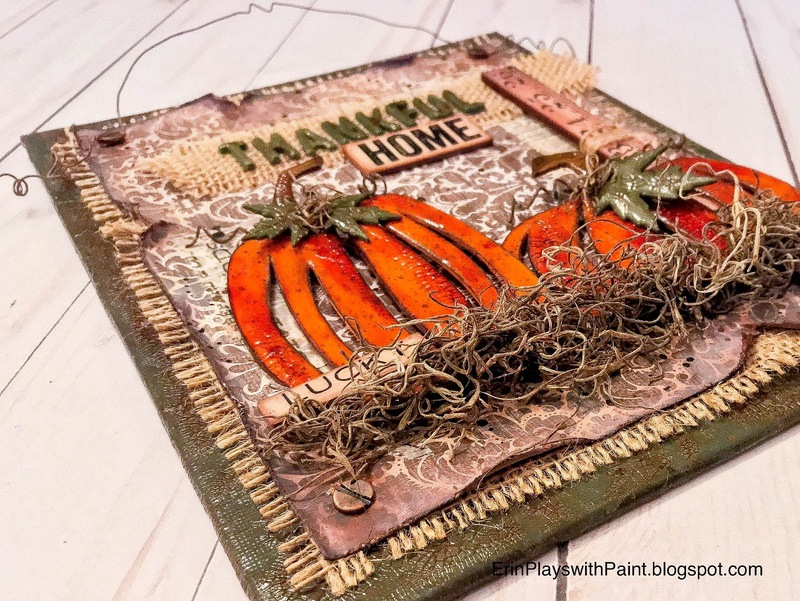 I’m excited to share a canvas panel I made for my favorite time of the year... fall! Beautiful leaves, football season, and family gatherings...but not quite the dreaded layer of snow! I started with a 7x9 thin canvas panel, painted with a mix of Picket Fence, Black Soot, and Peeled Paint distress paints. Then applied a Rock Candy clear crackle glaze randomly. Once dry, I applied Walnut Stain distress spray to make the cracks stand out, wiping back with a baby wipe before completely dry. 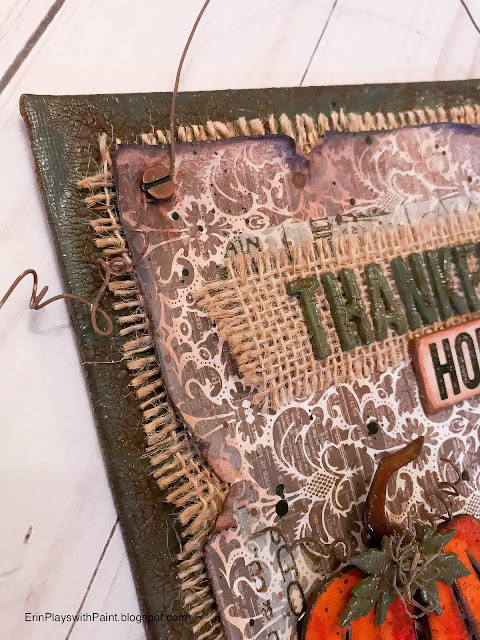 Next, I cut some burlap from a bag in my stash, slightly fraying the edges, followed by a layer of paper from the Tim Holtz Memoranda Paper Stash, distressing and inking the edges with Vintage Photo distress stain. I added some random strips of wash tape and Black Soot/Walnut Stain paint splatters to give it some extra depth and grunge. For the sentiment, I die cut letters from the Holiday Words Block set, gluing several layers together for more depth. Then painted with the same mix as the canvas - Black Soot, Picket Fence, and Peeled Paint. 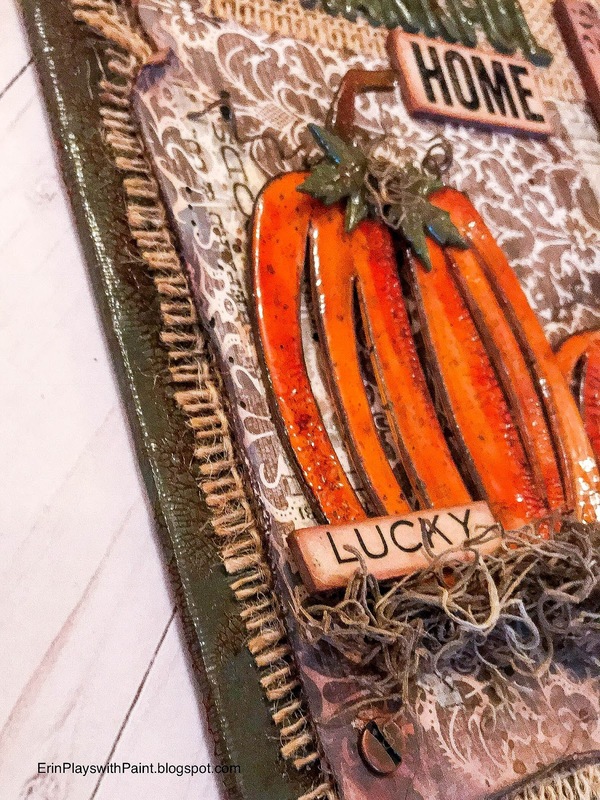 Again I applied a layer of Rock Candy clear crackle and Walnut Stain distress stain, and a final coat of Glossy Accents - the more dimension, the better in my book! 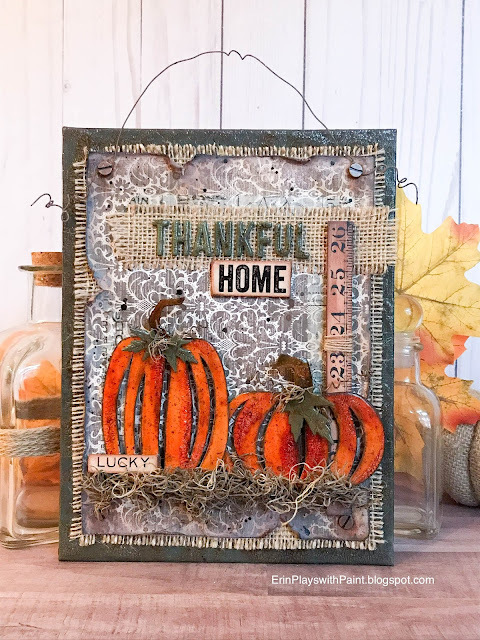 I added the HOME chipboard from Tim’s Quote Chip pack. 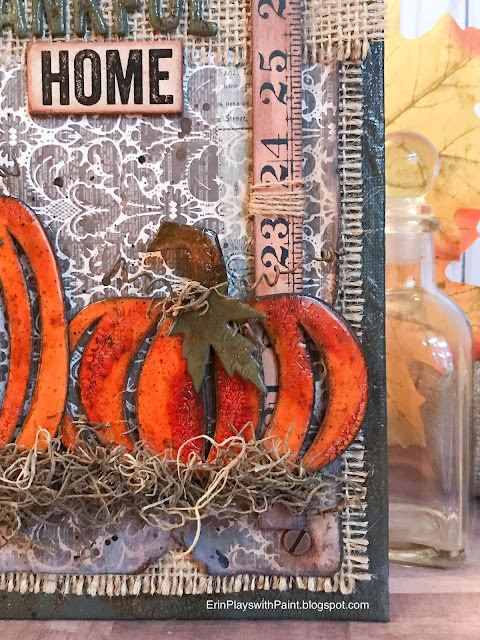 I love the way the pumpkins turned out -- I knew I had to have the Pumpkin Patch Bigz die as soon as I saw it! I cut several of each shape from thick white cardstock and glued them together. I painted both with a mixture of Rusty Hinge and Spiced Marmalade distress paints, and Walnut Stain distress paint for the stems. I randomly added some crackle glaze and, once dry, coated with Walnut Stain to help distinguish the cracks. Then, I covered them with a layer of Glossy Accents -- love this stuff, it's self-leveling so you end up with a really even top coat. As an afterthought, I spattered them lightly with Walnut Stain distress paint. The leaves I cut from Tim's Fall Foliage Thinlits die set. 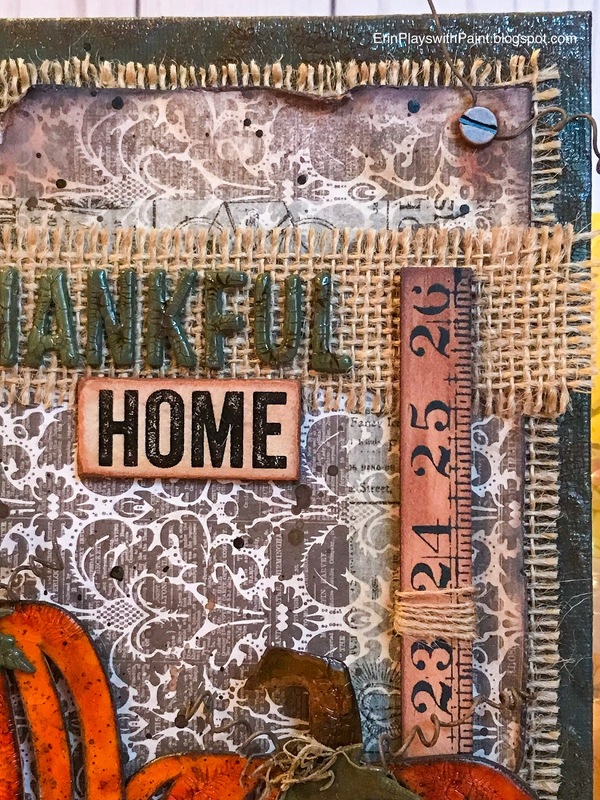 Painted with the same combo as the canvas and Thankful letters (Black Soot, Picket Fence, and Peeled Paint). Again it was followed by clear crackle, walnut stain wiped back, and a coat of glossy accents. I curled the wire and painted with Walnut Stain, and added some moss around the stems and base. I stuck in a LUCKY chip, also from Tim's Quote Chip pack. The ruler was stained with Walnut Stain distress ink and wrapped with a little twine. Finally, I drilled holes in the corners and added Tim Holtz Hitch Fasteners hardware and a wire hanger -- complete with a hint of Vintage Photo distress ink around the edges to age them a bit. Time to start some Christmas projects! Thanks so much for looking! UPDATE: I entered this project in the SSS Monday Challenge and was one of the lucky entries chosen for their Designer Spotlight! Just the extra boost of encouragement I needed for holiday craftiness!